Posted April 3, 2019 by Seán Kinane & filed under Immigration, News and Public Affairs. President Donald Trump has backed off his threats to close the U.S.-Mexico border; but he’s still going full steam ahead on plans for a massive wall along the border. There’s a protest against that wall this afternoon on the University of South Florida Tampa campus. WMNF interviewed David Jones, a first year student at USF majoring in Chemistry and a member of Tampa Bay SDS. That’s the group organizing the demonstration against Trump’s wall Wednesday in front of the Marshall Student Center. “We’re having a ‘mock wall’ event. Throughout the day we’ll be out with a mock wall that we have created to symbolize the oppression and hate that is coming with the wall that President Trump is currently pushing for. Recently Congress, essentially, said to the president, ‘we don’t think that there should be an emergency declaration to fund the wall.’ But then President Trump vetoed that. So it looks like the wall will be funded with emergency funds. Some of it coming from the military, etc. Is that one of the reasons why you say that the American people don’t want a wall like this? 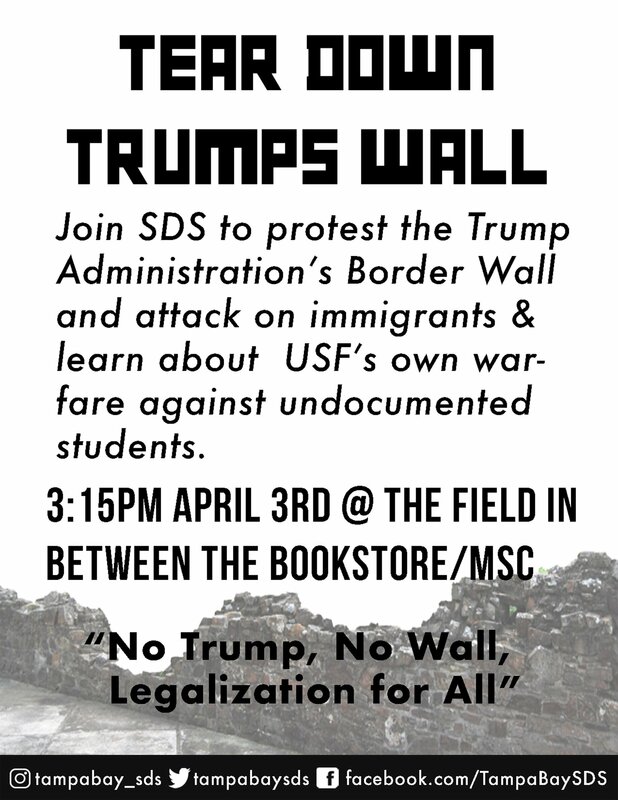 In your flyer it says that your group will also be demonstrating against what you say is ‘USF’s warfare against undocumented students.’ What do you mean?